This is a brand new genuine Amal Choke Plug (or blanking plug) that is used to close the air slide (choke) hole on the lid of the Amal concentric carbs when eliminating the air slide. 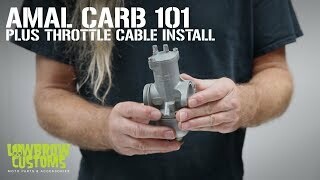 Seal that carb correctly to make sure air is not slipping by! I'm a long time Harley guy who recently picked up a 71 Triumph Bonneville. The Triumph world is new to me. You're prices and selection are top notch and your videos with Todd have been quite helpful. I'll have this old Bonneville up and running in no time thanks in part to you guys. Keep up the good work! Get rid of that useless choke! Cheap simple way to Eliminate the choke! Simple part needed - but came asap.